History: Rick Martel was one of those wrestlers that you thought would be around until death finally took him out. With over 26 years experience, Martel has been around. The first reference I have on Martel is in the Calgary Stampede promotion. In 1974, Martel and Lennie Hurst won the Stampede International Tag-Team Titles from Stan Kowalski and Duke Savage. The two eventually lost the belts to the Kellys in November. Martel's next challenge was overseas. In May 1977, he won the Commonwealth Championship (in New Zealand) from King Curtis Iaukea. He later lost to Ali Waziri (now better known as the Iron Sheik). Martel came back in 1979 to win the Commonwealth Title again, after it was vacated. He lost it to Ripper Collins, but won it for a third time later in the year by beating Mr. Fuji. He left New Zealand in late 1979, vacating the title. In 1980, Martel came to the NWA Pacific-Northwest, and immediately became one of their main stars. On March 22nd, 1980, he beat Buddy Rose to become the Heavyweight Champion. A few days later, Martel, teamed with "Rowdy" Roddy Piper, won the Tag Team Titles as well, beating the Kiwi Sheepherders. He held the two titles together until May, when they lost the tag team titles back to the Kiwi Sheepherders. In August 1980, when the Sheepherders left the NWA P.NW, Martel and Piper again were the Tag-Team champs. But, on August 16th, 1980, Martel lost a "Loser Leaves Town" match with Buddy Rose, forcing him to lose both the Tag-Team title (which Piper found a new partner for) and the Championship title. Martel then went to the WWF. Martel again hit quickly, forming a tag team with Tony Garea. They defeated the Samoans in November 1980 to become the WWF Tag Team champs. They held the titles for about 4 months before losing to the Moondogs. Martel and Garea came back one more time a few months later to reclaim their titles, then lost them to the team of Mr. Fuji and Mr. Saito. Shortly thereafter, Martel left the WWF. Martel next went to Montreal, where he became the International Champion in September 1982 by winning a tournament for the vacated belt. He lost the title two months later to Billy Robinson, then moved on yet again. His next gold was in the AWA, when he won the World Title from Jumbo Tsuruta in May 1984. 7 months later, he was finally defeated by Stan Hanson. Martel soon after decided to return to the WWF. 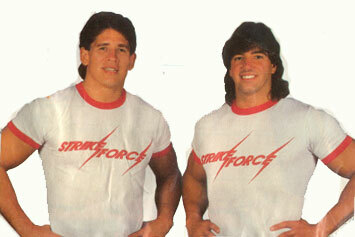 He joined with Tito Santana to form the popular tag team, Strike Force. 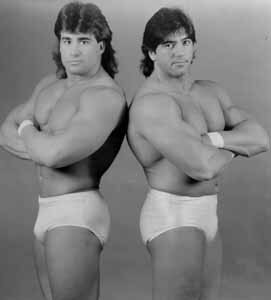 The team went on to win the WWF Tag Team titles (Martel's third) over the Hart Foundation in 1987. In March 1988, they lost the belts to Demolition, and soon went their separate ways, causing a minor feud between the two. 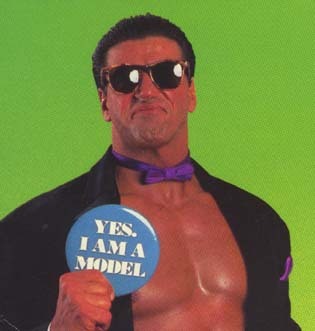 Martel then took on the name of "The Model" and stayed in the WWF for many years as a heel. The Model's most memorable feud during his time in the WWF occured when he accidentally blinded Jake "The Snake" Roberts, a fan favorite, with "Arrogance", his cologne that he sprayed around himself during matches. Martel later claimed that he never meant to spray Roberts, whose left eye appeared badly injured for months afterward. The two men met time and time again, with Martel usually having the edge due to Roberts' bad eyes giving him a blind spot. At the 1990 Survivor Series, Martel's team completely eliminated Roberts and his squad, then moved to the final round, where Martel was eliminated by countout. The feud between Martel and Roberts mainly came to an end after the two fought in a Blindfold match at Wrestlemania VII. With his advantage neutralized, Martel was DDT'ed and pinned by Roberts, losing the bout. Martel would rarely have another memorable feud for the next 5 years of his WWF career, although he did have battles with such wrestlers as Tanaka, Shawn Michaels, and the 1-2-3 Kid (more well known as X-Pac). But the Model's days of fame in the WWF were over. He would leave the WWF in '95, to wrestle in various independent federations both here and overseas. 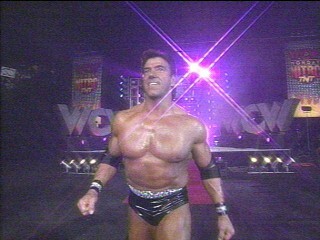 At the end of 1997, Rick Martel appeared in WCW for the first time. After starting feuds with Booker T and the Flock, he won the WCW Television Title from Booker T in February 1998. Although he only held the title for a few days before Booker T won it back, Martel proved he could still wrestle. An injury soon sidelined him, however, and he was out of wrestling for five months. When he returned, in a match-up against Stevie Ray, he injured his neck. Although the doctors told him it was repairable, Martel decided to retire. The 13-time title holder will be remembered as one of the most skilled wrestlers in the game. - GCW Onmi Thanksgiving Tag-Team Tournament '81 = Martel & Mr. Wrestling II defeated Ray Stevens & Super Destroyer, then lost to Kevin Sullivan & Wayne Ferris. Bob & Brad Armstrong won the tournament. - AWA Super Sunday (April '83) = Martel, Jim Brunzell, & Greg Gagne defeated Blackjack Lanza, Ken Patera, & Jesse Ventura. - AJPW Sumo Hall (July '84) = Martel fought to a Double Count-Out with Jumbo Tsuruta. Martel retained the AWA World Title. - AWA SuperClash I ('85) = Martel stayed the AWA World Champ after fighting Stan Hansen to a Double Disqualification. - PNCW Owen Productions 60th Anniversary Show (May '85) = Martel retained the AWA World Title after defeating Mike Miller. - AJPW 13th Anniversary Show (October '85) = Martel, the AWA Champ, and Ric Flair, the NWA World Champ, fought to a Double Countout. - AWA Wrestlerock (April 20, '86) = Martel fought to a Double Count-Out with Harley Race. - WWC Universal Title Tournament (September '86) = Martel was beaten by Terry Funk in the semi-finals. Carlos Colon won the tournament. - AJPW Budokan Hall (December '86) = The Can-Am Connection (Martel & Tom Zenk), as part of the Real World Tag League '86, lost to Giant Baba & Hiroshi Wajima. - WWF Wrestlemania III ('87) = The Can-Am Connection defeated Bob Orton & Don "The Rock" Muraco. - WWF Saturday Night's Main Event #11 (April '87) = The Can-Am Connection beat Nikolia Volkoff & the Iron Sheik. - WWF King of the Ring Tournament (September 4, '87) = Martel beat Dan Spivey, then fought to a Double Countout with Islander Haku. Randy Savage won the tournament. - WWF Survivor Series '87 = Strike Force (Martel & Tito Santana), the British Bulldogs, the Young Stallions, the Killer Bees & the Rougeau Brothers fought in a "Tag-Team Elimination" Match against the Hart Foundation, Demolition, the Islanders, the Russians & the New Dream Team. Strike Force was eliminated by Jim "The Anvil" Neidhart pinning Santana. The Young Stallions and the Killer Bees were the "survivors". - WWF Saturday Night's Main Event #14 (December '87) = Strike Force retained the WWF Tag-Team Titles by defeating the Russians. - WWF Main Event I (February '88) = Strike Force stayed the WWF Tag Champs by beating the Hart Foundation. - WWF Wrestlemania IV ('88) Strike Force lost the WWF Tag Belts to Demolition. - WWF Royal Rumble '89 = Martel competed in the "Royal Rumble", which was won by Big John Studd. - WWF Wrestlemania V ('89) = Strike Force was defeated by the Brain Busters. - WWF Summerslam '89 = Martel and the Rougeau Brothers defeated the Rockers and Tito Santana. - WWF Saturday Night's Main Event #23 (September '89) = Martel and Tito Santana fought to a Double Disqualification. - WWF King of the Ring Tournament (October 14, '89) = Martel defeated Bill Woods, Luke Williams and Jimmy Snuka, then fell in the finals to Tito Santana. - WWF Survivor Series '89 = Martel, the Big Boss Man, the Honkytonk Man and Bad News Brown fought in an "Elimination" Match against Dusty Rhodes, Tito Santana, Brutus "The Barber" Beefcake and the Red Rooster. Martel was eliminated by Beefcake. Rhodes and Beefcake were the "survivors". - WWF Royal Rumble '90 = Martel competed in the "Royal Rumble", which was won by Hulk Hogan. - WWF Wrestlemania VI ('90) = "The Model" defeated Koko B. Ware. - AJPW US/Japan Wrestling Summit (April '90) = Martel and Curt Hennig lost to Jumbo Tsuruta and Haku. - WWF Main Event IV (October '90) = Martel forced Tito Santana to submit. - WWF Survivor Series '90 = Martel, the Warlord and Power & Glory fought in an "Elimination" Match against Jake "The Snake" Roberts, "Superfly" Jimmy Snuka and the Rockers. Martel's team "survived". In the "Survivors' Elimination" Match at the end of the night, Martel was eliminated due to countout. Hulk Hogan and the Ultimate Warrior "survived". - WWF Royal Rumble '91 = Martel competed in the "Royal Rumble", which was won by Hulk Hogan. - WWF Wrestlemania VII ('91) Martel lost a "Blindfold" Match to Jake "The Snake" Roberts. - SWS Super Wrestle (December '91) = Martel was beaten by Naoki Sano, who became the 1st SWS/WWF Light Heavyweight Champ. - WWF Royal Rumble '92 = Martel competed in the "Royal Rumble", which was won by Ric Flair. - WWF Wrestlemania VIII ('92) = Martel was defeated by Tatanka. - WWF Summerslam '92 = Martel fought Shawn Michaels to a Double Count-Out. - WWF Survivor Series '92 = Martel was defeated by Tatanka. - WWF Royal Rumble '93 = Martel competed in the "Royal Rumble", which was won by Yokozuna. - WWF Survivor Series '93 = Martel, Adam Bomb, Diesel and I.R.S. fought in an "Elimination" Match against Razor Ramon, "Macho Man" Randy Savage, Marty Jannetty and the 1-2-3 Kid. Martel was eliminated by the 1-2-3 Kid. Jannetty and the 1-2-3 Kid were the "survivors". - WWF Royal Rumble '94 = Martel competed in the "Royal Rumble", which was won by Bret Hart and Lex Luger. - WWF Royal Rumble '95 = Martel competed in the "Royal Rumble", which was won by Shawn Michaels. - WCW/nWo Souled Out '98 = Martel lost to Booker T, who retained the WCW Television Title. - WCW Superbrawl VIII ('98) = Martel lost the WCW TV Title back to Booker T.